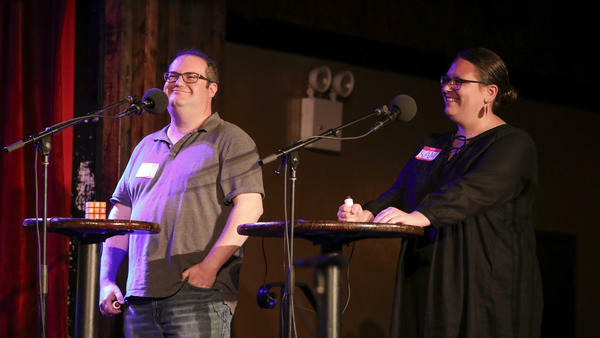 Contestants David Grazian and Sam Grossman appear on Ask Me Another at the Bell House in Brooklyn, New York. EISENBERG: Congratulations. You're probably the oldest person here. EISENBERG: Also, we've got a game about world capitals coming up. But first, let's meet our contestants. First up, Sam Grossman - you're a freelance writer, and your most-viewed article is about wine for cats. SAM GROSSMAN: Yes. That's true. EISENBERG: I have you hear about this immediately. There is wine for cats? GROSSMAN: There is. So a couple of years ago, I was covering weird Internet trends for Time magazine. So we found out that they had made non-alcoholic wine for cats out of catnip and cabernet grapes. GROSSMAN: So I loved that. So my editor and I decided we had to cover that. And we came up with a headline that a lot of other people stole. So if you see that headline anywhere else, know that it was originally mine. GROSSMAN: It was, "Never Drink Alone Again Because Now There's Wine For Cats." EISENBERG: OK, very good. When you ring in, we're going to hear this. EISENBERG: Your opponent is David Grazian. You're a sociology professor and author who, quote, "gets to live out fantasy jobs and write about them." OK. So what fantasy job have you recently been able to live out? DAVID GRAZIAN: All right, so I spent four years as a volunteer zookeeper to write a book about zoos. So I got to play with lots of animals and get bitten by only some of them. EISENBERG: I'm a little eh about zoos. Do we feel like that they are good places of great conservation and I should relook at it? GRAZIAN: You know what? I got to know a lot of zookeepers. GRAZIAN: And the zookeepers are really, really terrific. They don't get paid very much money. GRAZIAN: But they dedicate their lives to working with these animals. And they really, really care for them. GRAZIAN: So it helped me - made me feel a little differently about zoos. EISENBERG: Interesting. OK. So, David, when you ring in, we'll hear this. EISENBERG: Remember, Sam and David, whoever has more points after two games will go to our final round. Let's go to your first game. So we've combined geography and wordplay into a game called Word Capitals. Welcome to your nightmare. In this game, every answer is a country and a word that contains the consecutive letters of that country's capital. JONATHAN COULTON: For example, if I said, don't get stung when you view a collection of beehives in this island nation east of Fiji, you would answer apiary, Samoa. COULTON: Nobody understands why - because an apiary is a collection of beehives, and it contains Apia, Samoa's capital. Pronunciation may or may not be the same as the city, but the spelling is. They will all be this hard or harder. EISENBERG: Remember; we want the country and the word containing the capital city. Here's my advice. Ring in. Talk it out. We're here for you. At some point, this will end. EISENBERG: Here we go. Take pretentious black-and-white photographs of the Colosseum, the Venetian canals and one of your friends pretending to hold up the leaning tower. Anything come to you about the country? EISENBERG: ...That contains the capital of that country. Sam. GROSSMAN: Monochromatic, Italy. Monochrome, Italy. EISENBERG: Yes, that is it. EISENBERG: I'm going to be so excited every single time. COULTON: Hiking the Alps, be sure to pack your Army knife and a bottle of dry red wine. COULTON: Wow - Bern, Switzerland, being the capital. Well done. EISENBERG: We never thought anyone would get that. COULTON: Those are the only two questions we had. COULTON: ...Thought it was going to take longer. EISENBERG: Be sure to use bug spray to ward off these blood-sucking insects as you explore the Amazon jungle and the Galapagos. EISENBERG: The capital of Ecuador is Quito. And did you know that only female mosquitoes bite? COULTON: No, I didn't know that. EISENBERG: It's true. It's true (laughter). COULTON: I'm taking time away from this northern Ohio liberal arts college to spend a semester abroad near the Brandenburg Gate. EISENBERG: David, how are you doing? EISENBERG: You doing all right? We've got lots more games. EISENBERG: OK, keep them coming. Here we go. Prepare for your story's dramatic tension to reach its literary apex at Machu Picchu. GROSSMAN: It's Lima - climax, Peru. COULTON: Sam, I literally don't know how you're doing this. COULTON: Fold a square piece of paper into a swan in this Baltic state bordered by Estonia, Lithuania, Russia and Belarus. EISENBERG: Here we go, smarties. It's what a county is called in Louisiana, and it's a religious thing which you can appropriately ponder at Notre Dame Cathedral. EISENBERG: That was an amazing game. I just applaud both of you for being part of that. EISENBERG: All right, great game. Sam is in the lead. EISENBERG: Speaking of words in words, if you love the test in contestant, you should take a quiz and be on our show. Go to amatickets.org. Coming up, Jill Sobule is here. Jill is forever enshrined on one of the greatest '90s albums of all time, the "Clueless" soundtrack. Her latest album, "Nostalgia Kills," probably indicates that she doesn't want us to mention the "Clueless" soundtrack. EISENBERG: I'm Ophira Eisenberg, and this is ASK ME ANOTHER from NPR.